1. Preheat air fryer to 400°F. 1. Place Brussels sprouts, olive oil, balsamic vinegar and salt in a medium bowl and toss together. 1. Place Brussels sprouts in fryer. Cook until Brussels sprouts are crispy and brown, about 10 minutes, checking and shaking at the 5- and 8-minute marks. 1. Meanwhile, cook bacon on stovetop over medium heat and place on a paper towel-lined plate. Blot grease. Finely chop or crumble bacon. 1. Combine bacon, mayonnaise, lemon juice, garlic, horseradish and thyme in a small bowl. Garnish with additional bacon and thyme on top if desired. 1. 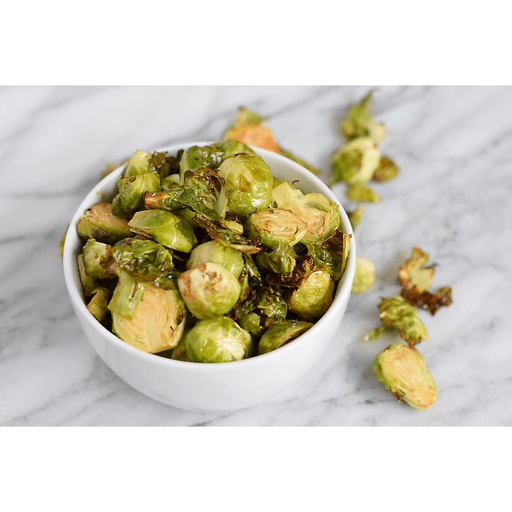 When Brussels sprouts are crispy and brown, remove from fryer and serve immediately with Garlic Bacon Aioli. Calories 180, Total Fat 17g (Saturated 1.5g, Trans 0g), Cholesterol 5mg, Sodium 390mg, Total Carbohydrate 5g (Dietary Fiber 2g, Sugars 2g, Includes 0g Added Sugars), Protein 3g, Vitamin D 0%, Calcium 2%, Iron 6%, Potassium 6% *Nutritional values are an approximation. Actual nutritional values may vary due to preparation techniques, variations related to suppliers, regional and seasonal differences, or rounding.